Another 68,000 Home Affordable Refinance Program (HARP) mortgages closed in August, putting the four-year-old refinance program on pace to close more than one million loans in 2013 for the second straight year. However, the program which was once touted for “underwater homeowners” is now decidedly less-so. As home values rise nationwide, the need for HARP loans at ultra-high LTVs is dwindling. It’s a program and product shift which could hasten the launch of HARP 3.0. Click here to get today's live HARP mortgage rates (Apr 21st, 2019). Are You Eligible For The New HARP? The Home Affordable Refinance Program was first launched in early-2009 as part of that year’s economic stimulus. It was among the new president’s first acts to help U.S. homeowners whose homes values had dropped since purchase. For this reason, the program is sometimes referred to as “The Obama Refi”. The typical homeowner was expected to save $3,000 annually via HARP. History is showing those estimates to have been conservative. Analysts did not expect that mortgage rates would drop towards 3 percent when HARP was first launched. Today’s typical HARP homeowner saves 27 percent per month. The Home Affordable Refinance Program is currently in its second iteration. The program’s initial release was successful — but not successful enough. HARP was created to help 7 million U.S. households. Through its initial three years, though, it had reached fewer than even one million. In late-2011, then, Fannie Mae and Freddie Mac released a HARP update. Dubbed HARP 2.0, the enhancements over the original HARP release were basic, but important. The first change was the removal of a rule which had previously limited HARP loans to 125% loan-to-value. With HARP 2.0, homeowners could refinance no matter how much they owed on their home relative to its value. Severely underwater homeowners in places like Florida, Arizona, Nevada and California were suddenly HARP-eligible — even those whom had been turned down or otherwise denied under HARP 1. The second program change was equally impactful. Fannie Mae and Freddie Mac removed some restrictions which made it tough to “change lenders”. Via HARP 2.0, homeowners were given the ability to refinance with any lender available. Loan volume has soared under HARP 2. There have been more than 2.8 million closings overall. 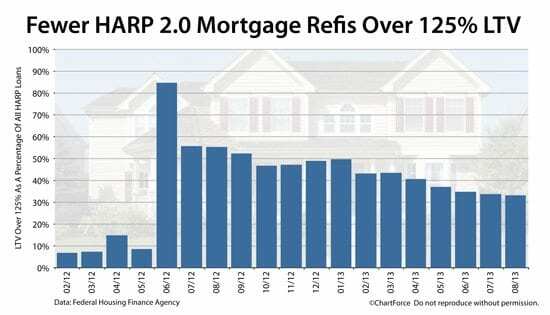 HARP loan volume has soared since the program’s re-release in late-2011. Through the first three years of HARP, fewer than 1 million closings were completed. Within the first 12 months of HARP 2, that figure was matched. 2.9 million HARP loans have closed to-date. It’s a big number — but still well short of program goals. HARP expires December 31, 2015 but, at the current pace of closings, it would take until 2018 for the government to close 7 million Home Affordable Refinance Program loans. That’s three years past deadline. Furthermore, the catalysts of HARP 2’s success are less important today. First, as the HARP program has matured, more U.S. lenders are able to offer it. There’s less value in being able to “change lenders” when the majority of lenders are HARP-loan participants. And, second, U.S. home values are rising. This has reduced the need for ultra-high LTV HARP loans. Over the same period of time, the percentage of homeowners using the Home Affordable Refinance Program with loan-to-values of between 80-105 percent is higher 10 percentage points over the same period of time. HARP is still in demand — just at lower LTVs. Shifts like this may hasten the release of HARP 3.0. When Will HARP 3 Be Available? HARP is a hit. As U.S. home values rise, though, the program is losing its sweet spot. HARP 2.0 was supposed to give severely-underwater homeowners the ability to refinance and it did — in droves. However, in 2013, there is less need for loans over 125% LTV and, despite a government-led PR campaign extolling the benefits of HARP, refinance volume is dwindling. It’s a shift which may lead to a third version of HARP, a program markets call HARP 3. The details of what a HARP 3 program would include remain muddied. The White House, with its “Better Bargain For U.S. Homeowners” program, has ideas of what HARP 3 should include. Congress has ideas, too, as detailed in the “Responsible Homeowners Act of 2013“. And, of course, Fannie Mae and Freddie Mac are allowed to introduce a new HARP version, much like they did with the program’s first upgrade in late-2011. HARP 3 might pass as soon this month, or this quarter, or not at all. However, as program volume fades, the passage of a HARP 3-like program seem to increase. The Home Affordable Refinance Program has been used more 2.9 million times since its inception. Yet, millions of additional U.S. homeowners remain unaware that they’re program-eligible. The good news is that it’s a particular advantageous time to use HARP. Mortgage rates are at their lowest levels in 18-plus weeks and loans are closing quickly. Compare today’s low mortgage rates to your current one. Rates are available online, with no cost and with no obligation whatsoever.